Henry Albert Schwabe was born on 25 March 1841, the son of Leopold and Emma Frances (Priestly) Schwabe. 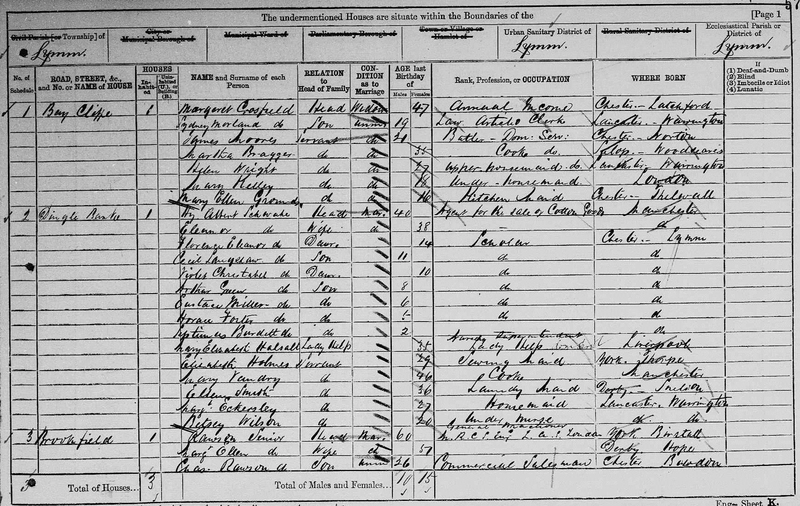 He married Eleanor Burdett on 14 April 1864 in Manchester Cathedral. Henry died on 11 May 1898 in Dingle Bank, Lymm, Cheshire. Eleanor Burdett was born in 1843. 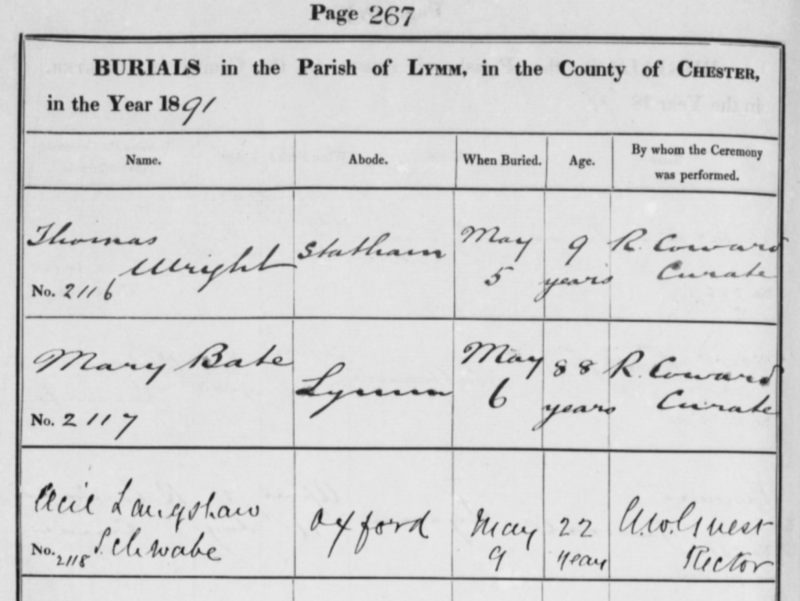 She died on 10 September 1895 in Lymm, Cheshire. Horace Foster Schwabe. He joined the 103rd Company Imperial Yeomanry in April 1901 with the rank of Lieutenant. He died of typhlitis at Johannesburg on 25 September 1901. He was 25 years old. Septimus Burdett Schwabe was born in 1878. 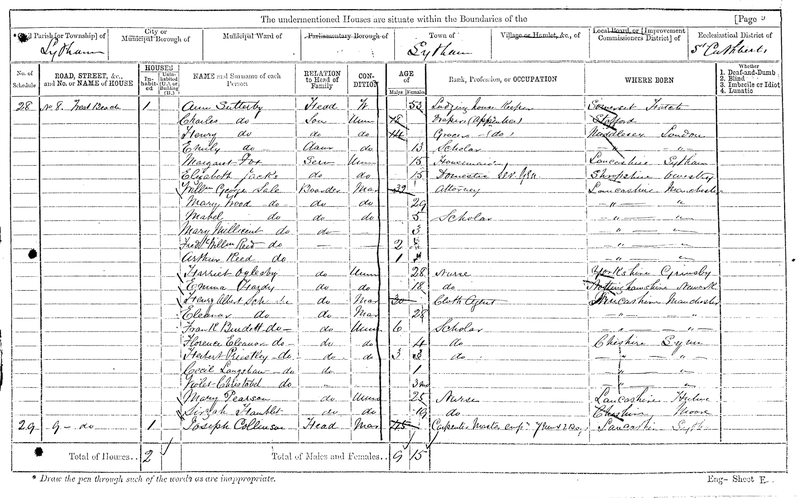 His baptism on 1 September 1878 is below. He died in 1947. 10. 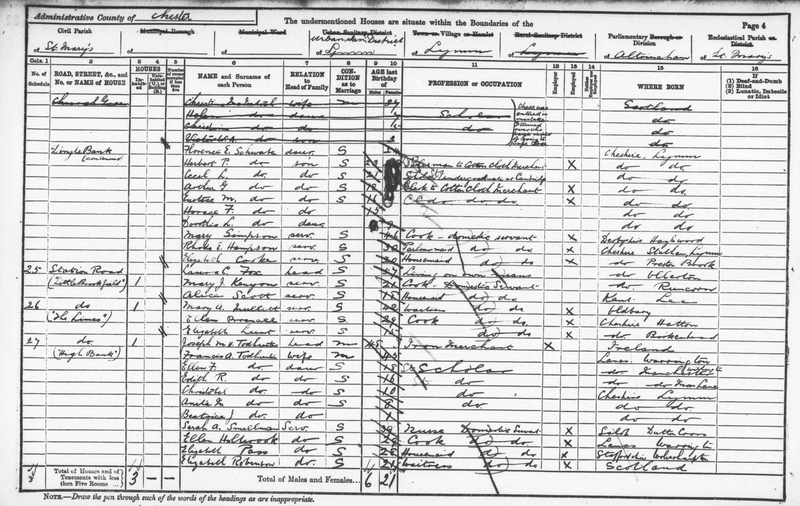 Dorothea Leonora Schwabe was born in 1882. Her baptism took place on 5 February of that year. West side: In loving memory of Henry Albert Schwabe born March 25th 1841 died May 11th 1898. South side: Also of Frank Burdett eldest son of Henry Albert and Eleanor Schwabe born March 5th 1865 died November 4th 1897. East side: In loving memory of Cecil Langshaw third son of Henry Albert & Eleanor Schwabe born October 11th 1869 died May 5th 1891. The souls of the righteous are in the hands of God and there shall be no torment touch them. North side: Also of Eleanor wife of Henry Albert Schwabe born Dec 31st 1842 died Sept 10th 1895. 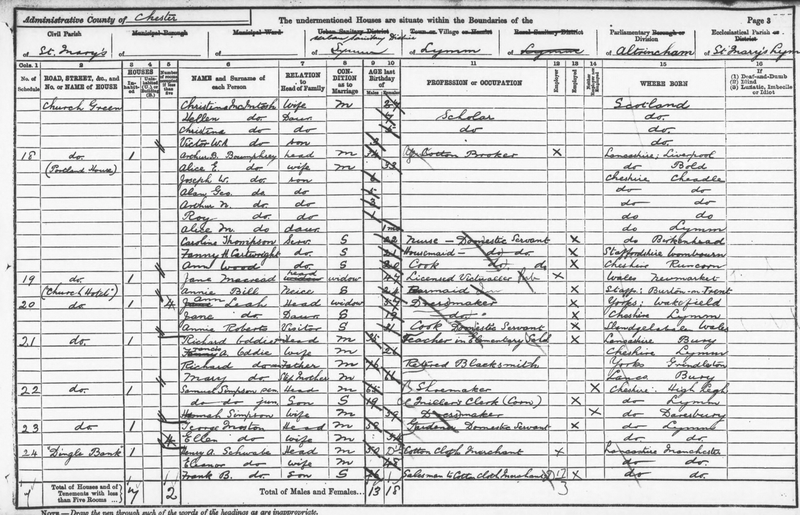 May 5 1891 At Oxford, Cecil Langshaw, 3rd son of Henry A. Schwabe of Lymm, Cheshire, aged 21. Cecil Langshaw Schwabe being the son of Henry Albert Schwabe, was the grandson of Leopold Schwabe and great grandson of Samson Benjamin. 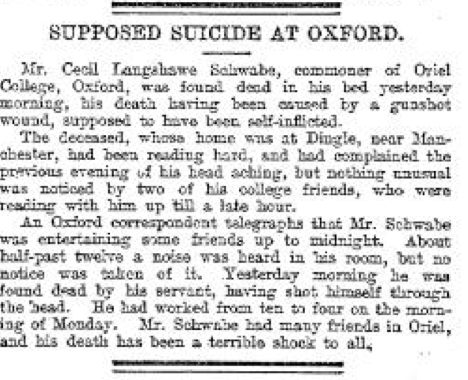 There are two entries in the Times of London Index for Schwabe for the year 1891:May 6th 1891 Oxford – Suicide of an Oxford Undergraduate About 7 o’clock yesterday morning Mr. Cecil Langhsaw Schwabe, undergraduate at Oriel college, who lodged in the town, was found lying dead on his sitting room floor with a bullet wound through his head, and at his feet a six-chambered revolver of heavy calibre, one chamber of which had been discharged, the other five being loaded. The deceased had been reading very hard lately, and at 7 o’clock on Monday evening he complained of a pain in his head, and said that he should do no more that night. He appeared to have then gone out and purchased the revolver. He was in his third year at the University and was 23 years of age. An inquest by Mr. F.F. Morrell, one of the University coroners, will be held this morning. 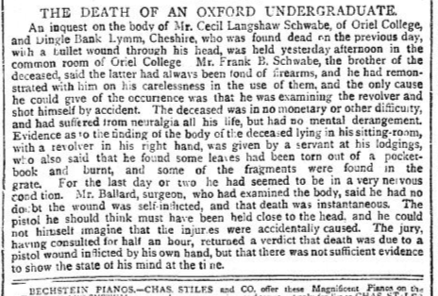 Inquest (a fuller description of the Inquest as reported by Jackson’s Oxford Journal can be read here) An inquest on the body of Mr. Cecil Langshaw Schwabe, of Oriel College, who was found dead on Tuesday with a bullet wound through his head, was held yesterday afternoon in the common room of Oriel College. 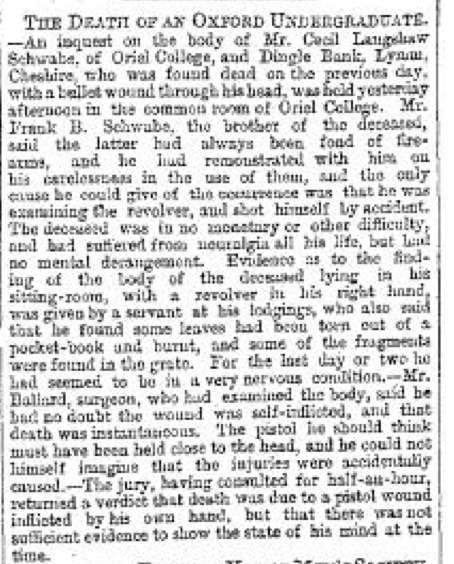 Mr. Frank B. Schwabe, brother of the deceased, said that the deceased had always been fond of firearms and he had remonstrated with him on his carelessness with the use of them, and the only cause he could give of the occurrence was that he was examining the revolver and shot himself by accident. The deceased was in no monetary or other difficulty. He had suffered from neuralgia all his life. He had no mental derangement. Mr. Charles Greaves Hodgson, an undergraduate of Oriel, said that on Monday afternoon he and the deceased were on the river, and in the evening he dined in hall. After hall they played a game of billiards, and they then read together in the deceased’s room from 9 to a quarter-past 10, when the deceased said he had a headache and should not read anymore. He was well on in his studies, and there was no need for him to fear not getting through. Evidence was given that the deceased had purchased a revolver on Monday evening, together with a box of cartridges. The Rev. Francis Henry Hall, dean and tutor of Oriel said that the deceased was quiet, industrious and well conducted, and was working for his last examination, which he had every prospect of passing. He was always in a feeble state of health. 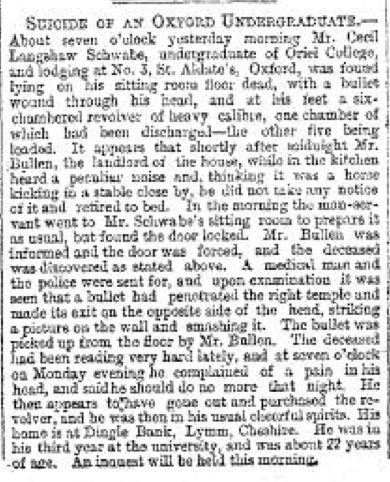 The jury, having consulted for half an hour, returned a verdict that “Death was due to a pistol wound inflicted by his own hand, but there was not sufficient evidence to show the state of his mind at the time”. 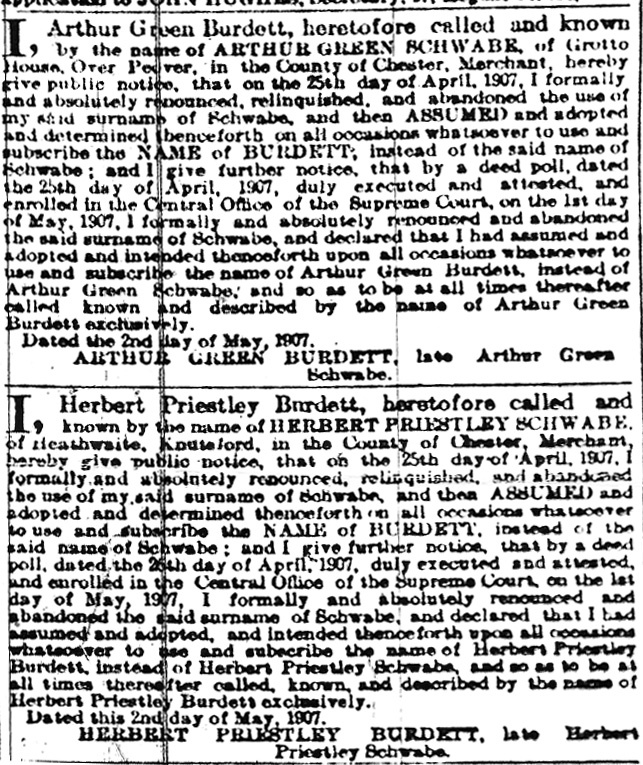 I, Herbert Priestly Burdett, heretofore called and known by the name of HERBERT PRIESTLY SCHWABE, of Heathwaite, Knutsford, in the County of Chester, Merchant, hereby give public notice, that on the 25th day of April, 1907, I formally and absolutely renounced, relinquished and abandoned the use of my said surname of Schwabe, and then assumed and adopted and determined henceforth on all occasions to use and subscribe the NAME of BURDETT; instead of the said name of Schwabe; and I give further notice, that by deed poll, dated the 25th day of April 1907, duly executed and attested, and enrolled in the Central Office of the Supreme Court, on the 1st day of May, 1907, I formally and absolutely renounced and abandoned the said surname of Schwabe, and declared that I had assumed and adopted and intended thenceforth upon all occasions whatsoever to use and subscribe the name Herbert Priestly Burdett, instead of Herbert Priestly Schwabe and so as to be at all times thereafter called, known, and described by the name of Herbert Priestly Burdett exclusively. Dated the 2nd day of May, 1907. Herbert Priestly BURDETT, late Herbert Priestly Schwabe. Florence Eliza (May) Schwabe was the daughter of Francis May and Eliza Harris. There does not appear to have been any issue. 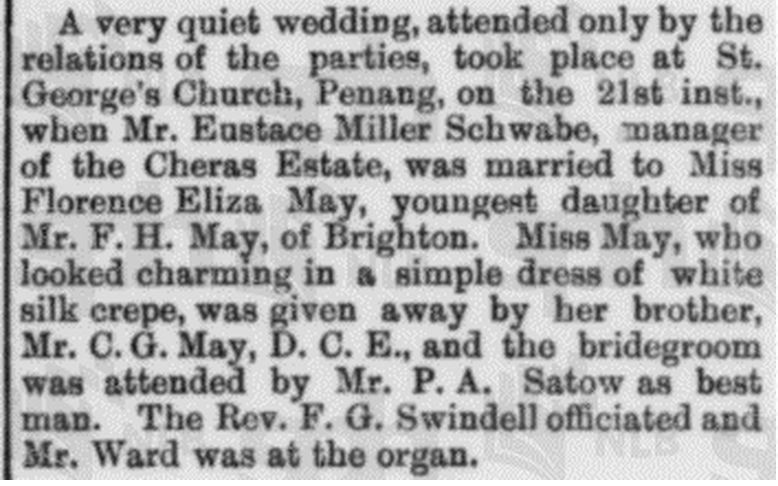 As noted above Florence Eleanor Schwabe (1867-1954) married Charles du Platt Richardson-Griffiths on 17 January 1894 at Lymm, Cheshire. Major RICHARDSON-GRIFFITHS, CHARLES DU PLAT was born 2 June 1855. He joined the 13th Foot 20 November 1875; became Lieutenant, Bedfordshire Regiment, 5 January 1876; served in the Afghan War, 1879-80 (Medal); was Adjutant 5 October 1883 to 31 December 1887; was promoted Captain 4 October 1885; was Adjutant, Militia, 14 July 1888 to 19 August 1893; became Major, Gloucestershire Regiment, 19 February 1896. Major Richardson-Griffiths served in the South African War, 1900-2. In command 2nd Battalion Gloucestershire Regiment from May to October 1900. 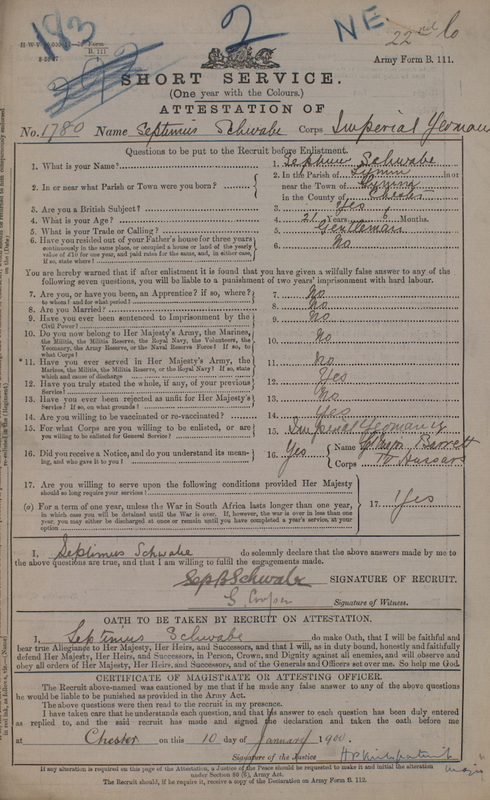 He was present at the Relief of Kimberley; operations in the Orange Free State, February to May 1900, including operations at Paardeberg (17 to 26 February); actions at Poplar Grove and Driefontein; operations in Orange River Colony, May to 29 November 1900; operations in Cape Colony, south of Orange River, 1900; operations in Cape Colony, north of Orange River; operations in Orange River Colony 30 November 1900 to 31 May 1902. He was mentioned in Despatches [London Gazette, 10 September 1901]; received the Queen’s Medal with three clasps; the King’s Medal with two clasps, and was created a Companion of the Distinguished Service Order [London Gazette, 27 September 1901]: “Charles du Plat Richardson-Griffiths, Major, Gloucestershire Regiment. In recognition of services during the operations in South Africa”. The Insignia and Warrant were sent to Lord Kitchener, and presented to Major Richardson-Griffiths by Major General G Barton in South Africa. Major Richardson-Griffiths retired 2 June 1903. He married, in 1894, Florence, daughter of H Schwabe. Source: DSO recipients (VC and DSO Book).